Cosmetic procedures continue to grow in popularity, especially as new techniques and advancements are made in the field of plastic surgery. Before undergoing a cosmetic procedure, it is critical for patients to consider the surgeon’s anesthesia preference. The difference should make or break your decision. Today, most, if not all, cosmetic procedures can be performed under local anesthesia, however, many plastic surgeons continue to place patients under general anesthesia despite the increased risk for complications. Dermatologic Surgery (February 2012) published a study based on ten years of data from Florida and six years of data from Alabama and found that more than two-thirds of deaths and three-quarters of hospital transfers were associated with cosmetic surgery performed under general anesthesia. Liposuction, one of the most common cosmetic procedures, accounted for 32 percent of cosmetic procedure-related deaths and 22 percent of all cosmetic procedure-related complications under general anesthesia. No deaths were associated with liposuction under local anesthesia. When a patient is placed under general anesthesia, the patient is placed on a respirator and an endotracheal tube is placed in the throat to help them breathe. A combination of drugs causes a deep sleep during the procedure and paralyzes the body. Some patients prefer general anesthesia because they want to make sure that they are completely knocked out and unable to remember anything about the actual procedure. Unfortunately, complication rates are much greater under general anesthesia and the body is put at a greater risk. Following a surgical procedure, patients often have a sore throat from the endotracheal tube, are very fatigued and more likely to feel nauseated or actually vomit. Recovery is considerably longer because the body has to recover from the surgery and the general anesthesia. Under local anesthesia with sedation, a patient is placed under intravenous (IV) sedation and the area that will be operated on is numbed. The patient is relaxed, comfortable and virtually unaware of the procedure thanks to light medication, but the whole body is not paralyzed. Local anesthesia is a much safer alternative to general anesthesia because it does not put the body under stress in the same way. Most importantly, fewer drugs are needed so recovery from the procedure is faster. Following a surgical procedure where local anesthesia is used, a patient can walk easily out of the office and does not have the nausea common with general anesthesia. Under local anesthesia, a surgical procedure becomes much less invasive and the risks to the body diminish significantly. The most recent studies by leading anesthesiologists, such as Barry Friedberg, M.D., share the professional opinion that most, if not all cosmetic surgery procedures, can be performed safely under local anesthesia with intravenous sedation. Despite this fact, a large percentage of people undergoing cosmetic surgery are still subjected to the risks of general anesthesia. The reason for this may be financial. 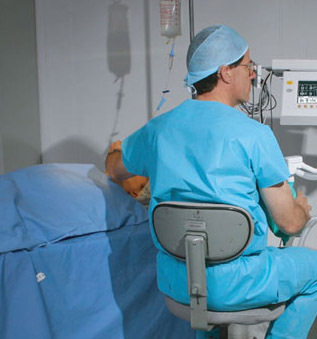 General anesthesia requires less prep time and more procedures can be performed in a day. However, the longer someone is under general anesthesia, the more stress it puts on the heart and lungs. With local anesthesia, the preparation time is longer and fewer patients can be accommodated in a day. But, the bottom line is that a patient’s safety should always come first – far more important than the financial bottom line. Prasad Cosmetic Surgery and Medi-Spa uses LITE anesthesia (Local, Intravenous, Tumescent, Ease of recovery) with great success for our patients. LITE is safer and allows for a much quicker and easier recovery.